Wrangler Rubicon is no new name for the off-road warriors and this gets proved with the fact that within a decade of its release the model turned to be one of the most grueling off-road trails in the world. The company planned to pay tribute to the Wrangler Rubicon and thus came to us the Wrangler Rubicon 10th anniversary Edition 2013 to battle and to prove its might against its prevailing competitor FJ Cruiser. Let us have a closer look at the modifications made to the dynamic Wrangler Rubicon upon its 10th anniversary. There isn’t much of change noticed in the interior of Wrangler Rubicon 10th Anniversary Edition, though the ones which are made are commendably adding glory to this off-road trail. The highlighted red leather seats with ‘Rubicon 10th Anniversary’ embroidered into the seatbacks makes the major change, despite the fact it isn’t. Reason to this is adding standards and glory for those too who are in divinity with the Wrangler Rubicon. The same red stitching also marks its impeccable presence on both leather-wrapped steering and the center-console. With these red and black leather and embroidered changes rest all remains same. Wait a minute yet eye-grabbing the instrument gauge cluster; yes the ‘frame’ too got the 10th Anniversary tag upon it. Being loyal we believe that the changes so made are enough for this particular model. To add the “Dual Cool’ effect to the Wrangler; a dual intake power dome has been added. The same works to keep the engine cool as well as also adds to the looks of Wrangler Rubicon. While the Mopar rock rails add to the protection concern from any kind of trail damage, the front and rear Red tow hooks will help your Wrangler Rubicon 10th Anniversary Edition get out of sticky situations. The hood gets the red-silhouette ‘Rubicon’ decal on the sides while the Jeep plastered a ‘10th Anniversary’ badge on fenders. Last but with same glory is an extra-half inch availed to the drivers on Wrangler’s standard height. Matching with the ancestor the model carries a 3.6 Liter V6 Pentastar engine, producing the same 285 hp, mated to five speed automatic or six speed manual transmission. The Wrangler Rubicon 10th Anniversary Edition is available in both two and four door body options featuring an electronic-locking front and rear Dana 44 axles. 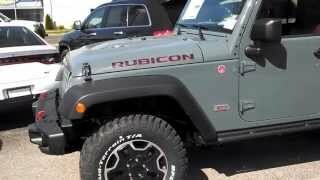 Now comes the important thing for buyers of Wrangler Rubicon 10th Anniversary Edition, the pricing of model. The Company is still to release the price but presumptions say that the model is expected to take around $30,000 from its fans pocket. Which at our front we believe is acceptable.